Miskatonic University features students and faculty of the famous Arkham institution. They have an insatiable curiosity and depth of knowledge - which translates into a lot of investigation and card draw effects. This is the "rush" faction so they tend to be fragile in terror and combat. They have some control effects that restore characters, as well as some icon manipulation. They also have the most and best Tome cards in the game. 1. Bruno Carioli (TiV) - Probably now one of the best weenies in the game, along with Alternative Historian. 2. Whitton Greene (SoK) - the toughness and additional investigation struggle booster is great; the ability that gives card advantage is icing on the cake. 3. Lucas Tetlow (SoK) - An invulnerable 2 cost character that steals support cards. 4. Museum Curator (TWB) - A cheap chud character that puts into play additional cards, which means he is card and resource advantage. 5. Combing the Archives (LR) - With two investigation struggles and no terror or combat, this is the rush deck's dream story. Combined with Open for Inspection (Core), you can win this story handily, even if opposed. 6. Daring Buju (SoK) - The surprise factor of this card is unmatched in MU, especially at that price point. The 3 steadfast make it most useful in a mono build, but it is possible to run it dual-faction for a shocking turn of events at a story. Another one of my favorite MU cards Binding (Core), falls into this category of surprise control, but the Buju is better. 7. The Necronomicon (SoA) - While it is expensive, this card is frightening to play against if you don't have ready support control. If you have a way to recur it, like Archaeological Dig Site (SfW), Combing the Archives (LR), Marcus Jamburg (***), or ways to protect it like Library of Pergamum (***), then you can steal one problematic character and destroy it if they dare oppose. 8. Andrew-Chapman (TKatG) - He offers character protection and he's not loyal like the other explorers. 9. Alternative Historian (SoK) - A wonderful chud. She replaces herself, and gives you the ability to control critical struggles to push through on investigation. 10. Flux Stabilizer (PT) - The last card is hard to choose, but I had to choose this one because of its ability to disrupt so many good and popular "enters play" cards like Stalking Hound (PT), Black Dog (***), Master of the Myths (IT), Dreamlands Fanatic (ItDoN), Broken Space, Broken Time (CoC), Shocking Transformation (Core), and Under the Porch (THBtS). Open for Inspection (Core) - Another quintessential rush card, which can sometimes allow you to win a story all in one go. 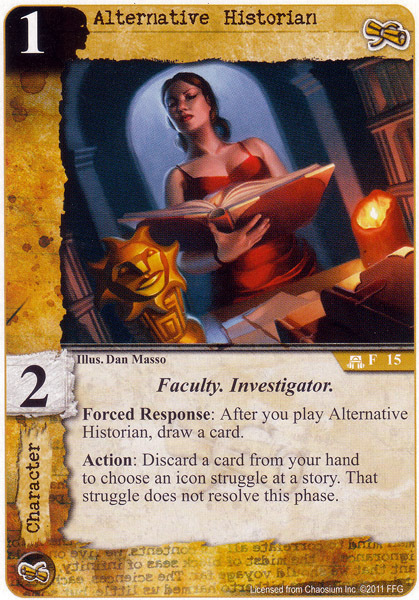 Anthropology Advisor (Core) - Perhaps one of the best representative cards of the Investigator build, which is a prominent subtype in MU. Reduction, good icon spread, and giving investigation to your characters is pretty good. Mask of Sthenelus (IT) - I just love this card. It's a great way to protect your important characters, or send them into a story alone, and since it's a relic, it goes back into your deck. Professor of Folklore (ER) - His ability is similar to Forest Sister (Core), who is well-known as being very resilient, but this works for any MU character. So he can just sit back on the sidelines and protect your key characters. Board of Trustees (SoK) - Very efficient for a 4 cost invulnerable character. Since Y'Golonac (Core) sits at the same price point and he's an autoinclude, I wonder that more people don't run the Board, but 4 cost is just expensive in MU. However what you get for 4 cost is pretty amazing. His passives just let you power through some stories for the investigation, but he can take on stories on his own. Binding (Core) - One of my favorite cards probably of all time, it's such a good toolbox card. You can play it with Hastur to do surprise insanity, or with Agency for surprise combat, or just to power through on investigation. Dr. Laban Shrewsbury (WaB) for his ability to bounce AOs repeatedly - when your deck gets thin enough, your opponent won't be able to keep any AOs on the table and will be hemorrhaging resources if he tries. Mu (SoK) - This takes a lot of the sting out of the terror and combat struggles. If you can mitigate the attrition rate of your characters, there isn't a lot that any deck can do to stop you rush stories. Dr. Carson (TSotS) is a similar effect, but a little slower and more vulnerable; he was (and still is?) a very good card. Binding (Core) is probably my top favorite. Its cheap, and if played right it almost always lets you kill a character and give you some succes tokens as well. Alternative Historian (SoK), everything is nice about this card, its cheap, good subtype, draw a card, discard a card from hand to skip any struggle at any story you like. Discarding cards shouldnt be that hard with Miskatonic as they have many cards which allow you to draw cards. And discarding cards does not always have to be a bad thing when playing Yog or some kind of recursion combo. Cant really say much about most of the seeker of knowledge cards as I have not yet seen them in action. About Mu (SoK), the wound mitigation will only work when the character has toughness. Its a response, no disrupt, so you wont prevent the wound but remove it after resolving all struggles. Still could be usefull when used in a rush deck which includes Syndicate and Dutch Courage. About Ipiutak (SoK), I really like to try this card, it seems to have many possibillities. You wound/destroy or let me sacrifice a character? Ok, then one of yours dies to and even nicer, I get to pick. Thinking of mixing it up with Yog and use cards like Casting off the Skin (WitD), Blood Magician (CoC) and another event that gives your character some icons and when overpaid lets you take the event back in hand. Dont remember the name of the card. Those cards are nice of themselves but do really shine if I could double the effect. I probably wouldn't have included Mu and wouldn't have thought of Daring Buju because I really never play mono-faction decks, so Steadfast 3 makes it hard to use. Instead I'd have included the Chess Prodigy and Alternative Historian - the latter being my latest favorite Miskatonic card. I'm always a bit doubtful about Open for Inspection because of it's potential to backfire: You have to be very, very sure you're going to win that story right away, else you might have ended up helping your opponent to win it! Still, it's a staple and it's from the core set. Expert Testimony (SoK) is a lot safer to use and serves a similar purpose, though. I also like A Vörös Hal'l Jön since it's the best tutor card currently in the game. It would also work well together with the new card Board of Trustees (SoK). You really want to remove those wounds before the character readies. Very good thoughts. This list is a lot harder in some ways than the Shub list, since there are some iconic cards that have always been good, and some bomb cards from Seeker. Alternative Historian is also my favorite weenie right now! Mad Genius (Core) to use his ability every turn. Should we take Mu off for Alternative Historian? Good list overall, and yes - Alternative Historian deserves a spot for sure. Mu I think is situational enough that it can come off to make room. If you like Professor of Folklore, Infirmary is another good card to save your characters that doesn't require a per-use cost, but it's only good in mono decks. I think on your podcast, you said you weren't that impressed with her. I'm glad you've come around! 1 cost for a character that replaces itself, and gives you an option to negate one struggle. It is pretty fantastic. Flux Stabilizer is such a good card. I'd probably put it higher in the current meta. If a single person ran x3 copies at worlds last year, they would have wrecked many decks. So many of us counted on the ability to bring characters into play via trigger. Just added honorable mentions. Let me know if you think you want to add more. I want to be a tad selective so that the list is actually helpful, but also so we can generate discussion. 1. Anthropology Advisor (Core) - Perhaps one of the best representative cards of the Investigator build, which is a prominent subtype in MU. Reduction, good icon spread, and giving investigation to your characters is pretty good. 5. Open for Inspection (Core) - Another quintessential rush card, which can sometimes allow you to win a story all in one go. 7. The Necronomicon (SoA) - While it is expensive, this card is frightening to play against if you don't have ready support control. If you have a way to recur it, like Archaeological Dig Site (SfW), Combing the Archives (LR), Marcus Jamburg (WoP), or ways to protect it like Library of Pergamum (WoP), then you can steal one problematic character and destroy it if they dare oppose. Mask of Sthenelus (IT) and Disc of Itzamna (TBJ) which give great protection to key characters. 10. Flux Stabilizer (PT) - The last card is hard to choose, but I had to choose this one because of its ability to disrupt so many good and popular "enters play" cards like Stalking Hound (PT), Black Dog (WoP), Master of the Myths (IT), Dreamlands Fanatic (ItDoN), Broken Space, Broken Time (CoC), Shocking Transformation (Core), and Under the Porch (THBtS). Chess Prodigy (THBtS) - he has an excellent ability to control struggles, and for a long time was the key card of investigator decks. Well, I didn't necessarily forget him, but I did leave him off because I'm not sure if he's top 10 since he's so vulnerable and he's loyal; similar arguments for Scientific Text, I guess. I've never found him to be so great for card draw in today's environment. But he is still good, especially in a mono-MU deck, or with a dreamer theme. I can add him to the honorable mentions if people want? Why does no one like the m.u. conspiracy!? It costs 0 and completely ignores the terror and combat phases. I have put it to good use in my m.u. rush deck. I will second recommendations for Lucas Tetlow (SoK), Flux Stabilizer (PT), and Ipiutak (SoK). Each of them give Miskatonic some ability to deal with the more frustrating strategies that the MU folks are likely to face. I love it. Combing the Archives (LR) is a great card, gives MU a very safe place to play all their Arcane and Investigation icons. Combos well with Open for Inspection (Core), for some very fast story wins. (I also really like From the First Degree to the Last (TbtA), but it's off-faction and has a cost of 1, so only really works in MU/ST decks.) Just be careful about Investigation-heavy Agency decks and Arcane-heavy Yog decks . . . Finally, I have to make a couple of honorable mentions. First is Obscure Linguist (AoA); yes, he's expensive, yes, he's vulnerable, no, you're not likely to get him out until late-game. But when he does come out, he will wreak havoc on late-game icon struggles. Finally, don't overlook the Overworked Graduate Student (SoK); he can help accelerate a lot of MU decks, and is one of the better cheap cards to boot. Best card in the game? It's up there. Should be restricted. Updated with a couple new Top 10 cards. I took a few off the honorable mention list as well because I never see them played anymore. Chess Prodigy could probably come off now too since there are better options now. MU Necronomicon still in top 10? I cant see myself using this card in my deck, is there something about the card im missing? Cost 4+3/use is as bad as it gets in this game, even 3+4/use would be better. It exhausts so you can't even take 2 chars with 3-3 domains. And both MU curator and Jamburg got restricted, so its harder to cheat around this 4 cost. yeah. Matthew is the bomb. Poll Next Pacta Arcana (#7) pact up for vote! [Deckbuilding] I Hate Snakes, Jock!